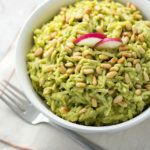 This Avocado Curry Orzo Salad uses avocados and Greek yogurt for creaminess, instead of mayo. Healthy and fresh tasting, with a spicy note from curry. This is great as a side orzo pasta salad, or a main vegetarian dish. Today has been pretty great! Gizmo and I have been keeping each other company as I work on recipes and cooking, picking blueberries, chatting with my neighbors, and taking it a little easy. I have a shoulder injury that I am nursing, so I am being careful, and saving the heavy lifting for Paul when he gets home. His Honey-Do list is never empty (Thanks, Honey!)! I have been making a lot of orzo dishes lately as boxes of orzo pasta were on sale, and I bought a few! 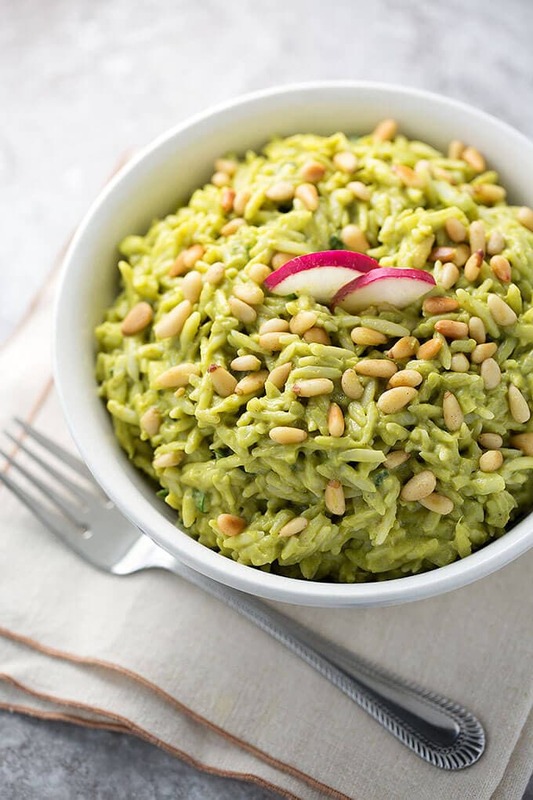 This particular recipe, Avocado Curry Orzo Salad, uses less than a dollar’s worth of pasta! A little less than half the box. And it is healthy! The Avocados and the Greek Yogurt make it creamy, instead of using mayo. It has a nice spice to it from the curry, and it is tasty and cool on a warm Summer day! Gizmo is wondering why I keep going back and forth to the fridge. I’m checking to see if it’s cold enough for me to dive into yet (and I take a bite every time I check!). It really is best served chilled, and I can’t wait until this batch is cold! I hope you like it as much as I do! This orzo salad uses avocado and Greek yogurt for the creaminess instead of mayo. Healthy and fresh tasting, with a spicy note from the curry. 3 small Avocados, pitted and flesh removed from the skins. Cook orzo in lightly salted water to package directions for al dente (usually 9 minutes). Drain, and rinse in cold water to cool pasta, and set aside. Toast the pine nuts on a medium high heat in a frying pan (cast iron works well for this), stirring constantly, until they start to brown. Then remove from the pan to a small dish and set aside. In a medium size mixing bowl, mash the avocados. Add the lemon juice, lime juice, vinegar. Stir. Press the garlic into the bowl (use a garlic press, or grating with a zester will work). Add the Greek yogurt, salt, curry powder. Mix well. Add the finely chopped onion, and cilantro. Mix well. Add the cooled orzo to the avocado mixture and stir until combined. Garnish with the pine nuts. Best if you chill this in the refrigerator 1-2 hours before serving so the flavors have time to develop.